Former aviation minister, Femi Fani-Kayode, and his family, have disowned three children from Mr. Fani-Kayode’s former wife, Yemisi, questioning their paternity. In a lengthy article published on Saturday, a representative of the family, Felix Olawunmi, narrated a turbulent post-marital relationship between the former minister and Yemisi, and said the issue of the children’s parenthood had been on for years. The family said Yemisi, the daughter of a former Lagos state judge, refused repeatedly to allow the three girls undergo a paternity examination as requested by the Fani-Kayodes. The former minister said he and his family had restrained themselves from going public for years, but that they became upset after ThisDay recently published a “libellous” piece about him and his former wife. The family said they will no longer have anything to do with the three children and their mum, Yemisi. Contacted, Mr. Fani-Kayode, who recently changed his name to Femi Olukayode, told PREMIUM TIMES the article was the position his family. He also confirmed that Mr. Olawunmi wrote on behalf of the family. The piece titled: “Temitope Fani-Kayode’s blissful conjugal” published in THISDAY of last week Saturday contained huge incorrect and misleading information. The motive, source and credibility of the information published are highly doubtful. 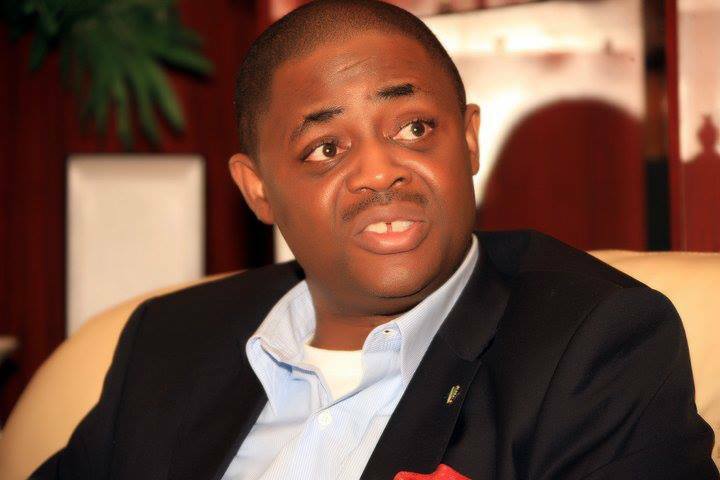 Nigerians are urged to discountenance the disparaging remarks made against Chief Femi Fani-Kayode in the publication. As a member of the Fani-Kayode family and one who has followed closely the life and career of Femi-Fani-Kayode for almost 50 years, I believe it is pertinent for me to set the record straight. In 1989 or thereabout, Femi got involved with Yemisi Adeniji, the daughter of Justice Adeniji of the Lagos State high court. He had been married previously to his first wife, Saratu Attah, in 1987, and had a child with Saratu whose name is Folake who was born in 1987 but by that time Saratu and Femi had separated. Yemisi and Femi got very close and spent much of the time together and eventually she got pregnant. When she got pregnant, the issue of marriage came up. Femi’s father, the late Chief Remilekun Fani-Kayode, objected to the marriage because he believed that Yemisi was not a stable character and was not a serious minded person. He also had lots of contempt for her background. Femi insisted on going ahead with the marriage simply because Yemisi had said that she was carrying a child and that if he didn’t marry her, she would kill herself and the child inside her. It was on that basis that they proceeded and got married. Femi’s father refused to attend the marriage ceremony and told him that it would not last because he could see through Yemisi. Femi’s mother attended the marriage and Chief Duduyemi who was like a son to Femi’s father came to represent the father. Once the marriage took place and everything was initially okay, they went to the UK to have the child. But throughout the marriage from the beginning to the end, it was turbulent and unpleasant. They had two children – Temitope and Tobiloba. Both of them were born abroad. At the end of 1993, Femi went to the Bible Seminary in Ghana. No sooner had he left than she said she would never have anything to do with him again and that was where the marriage completely broke down. There was another development that affected the relationship. Yemisi’s father was implicated by the Justice Kayode Esho panel that probed the Nigerian judiciary and the recommendation was that he be kicked out for corruption. Yemisi and her father told everybody that cared to listen that it was Femi’s father that was behind this. Throughout that period and regardless of the fact that they had separated, Femi did his best to send money to Yemisi and school fees and allowances for the children. When Femi’s father died in 1995, he came back to Nigeria. The family questioned the paternity especially of the last child, Tumininu, and not only that, they were so disgusted by Yemisi’s behavior and the insults and the things she kept saying about the family that nobody wanted her and her children to attend the burial. That was why their names were not listed among Femi’s father’s grandchildren during the burial notices. They forced themselves on the Christian wake-keeping. After that, and for a number of years, Femi remained in touch. He kept sending her money for the children. He kept doing his best to take care of them. Even when Femi went to Ghana on exile in 1996 and came back again to Nigeria in 2001, throughout that period, he was in touch. He kept sending money to all three children irrespective of the uncertainty over their paternity. He took care of their school fees; he took care of their needs and gave as much as he possibly could. By 1995, he formally divorced Yemisi and inside the affidavit of divorce, he wrote there that one of the reasons was because he questioned the paternity of especially the last child. For fear of being exposed about the real paternity of the children, Yemisi offered to settle out of court and the divorce eventually went through and that was the end of it. After that, Femi got married to Regina his third wife in 1997 and moved on with life as she did as well. He had a child from that union by name Remilekun in 1997 and spent most of his time in Ghana but eventually, he came back to Nigeria. Throughout those years, he kept sending money to the three children by Yemisi. He did his very best despite the fact that all through the years, all that Yemisi Adeniji did was to abuse him, insult him and tell lies about his family. When in 2001, Femi returned to Nigeria and Yemisi reached him and he saw the children from time to time. He did his best for them throughout that period. Eventually, he got into government and all she ever did was just to demand for money. He did his best for her. He kept on doing the best he could do; he kept on taking care of the children. When Femi was appointed a minister, Yemisi tried her best to scuttle his ministerial clearance in the Senate by telling lies about him all over the place but she failed. After he was confirmed as a minister, she now decided to settle with him and tried to restore a reasonable relationship and she begged for help. Femi assisted her and the three children. He even bought a house for her in London. Femi did all these purely out of compassion and not because he owed her anything. Quite apart from that, throughout that period, he was taking care of the fees of the children, by cheque, by transfer, by cash and he was seeing the children regularly. When Femi stopped being minister and EFCC started hounding him, she then started sending abusive text messages and saying he was going to go to jail. What caused that hatred was simply the fact that Femi was happily married to somebody else and had moved on with his life. Nevertheless, Femi still interacted with the children for quite some time. Eventually she poisoned the mind of the children that not even the children themselves ever acknowledged nor ever came to court to support Femi during the case. Femi refused to have anything to do with them from 2012 onwards. From that period, he cut himself off completely and Yemisi’s desperation got more. Yemisi was granting series of interviews, denigrating him, running him down and saying he had done nothing for the children. Eventually, a few weeks back, Femi read on the internet that one of the children was getting married. Once he read that, he reached out to the Randle family saying that “if you are getting married to anybody that bears the name Fani-Kayode, we should know about it”, but he said Yemisi objected to Femi’s family having anything to do with the marriage and that if he wanted to have anything to do with the marriage, he should try and settle everything between them first. So, Femi’s family members met with the Randles and with Yemisi’s mother. Femi’s family asked uncles like Chief Alex Duduyemi to intervene because they would not participate in this wedding unless one condition was satisfied and that condition was this, that all the three children have a paternity test. Despite Femi’s pleas that his family should try and overlook that, they said no way. So when they said they would not go for the paternity test, Femi’s family said they would not have anything to do with the wedding. The family has it on good authority that the July 5th day set for the wedding was in the hope that Femi would have been jailed by then and that his being jailed would also be celebrated at the wedding. The Randle family didn’t reach out to Femi’s family, and in Yoruba tradition. All Femi’s family asked for was a paternity test which they refused to do. Once it was clear that all the discussions did not bear any fruit, the family as led by the head of the Fani-Kayodes now took a decision that a few days before the marriage, they would take a full page advert and also announce on television that the girl was not their daughter and that she has nothing to do with the family. But at the last minute, Femi intervened and appealed to all the elders to just ignore them and leave them. They had the first ceremony, they had the second ceremony, they had the third ceremony, not one of Femi’s family members attended. The only one that attended was Femi’s first daughter, Folake, and she did that with his understanding. The talk that Femi didn’t do anything for the children is all rubbish. He did plenty for the children. They said that he was beating Yemisi while pregnant. It is all lies. If he was beating her, why did she stay to purportedly have two more children? Why should anybody be concerned about things that happened in a marriage that finished almost thirty or twenty five years ago? Femi has moved on. He has a very good relationship with the mother of Folake. He has a good relationship with Folake. He has a very good relationship with the mother of Remilekun. He has a good relationship with Remilekun, his youngest daughter. It is only Yemisi that he does not have a good relationship with because she’s full of bitterness and hatred and envy. There is no way he would have a good relationship with her children because they have no respect for him, they have never honoured him; they wanted him to go to jail. The only recognition they have before high society is the fact that she is Femi Fani-Kayode’s ex-wife. The only reason why people recognise Yemisi’s girls is because Fani-Kayode is attached to them. As far as we are concerned in the Fani-Kayode family, Femi has two children, Folake and Remilekun. The family does not recognize those other three. We don’t wish them ill; we have no hatred for them. They are not just part of us. So, nobody should be surprised that we didn’t go to the wedding. And there is no question of reconciling with supposed daughters that have no respect for their father, that have no love for their father and have done nothing but run their father down everywhere. In fact, there was a time Femi begged them to change their name from Fani-Kayode because in our culture, what they are doing is shameful. You do not side with one parent against the other, and you do not expect a man, a father, to take rubbish from a child. Their mother is so embittered, so full of hate and malice. They have chosen to go that way and we have chosen to ignore them and not to go on a war path with them or start talking about them because we have class and they do not. So, Femi does not hate his children. He is just indifferent to the ones borne by Yemisi. He has no fatherly feeling for those children except for Folake and Remilekun. The lies that he is an absentee father that never takes care of his children could only have come out from a hateful, venomous and malicious heart. Anyone can ask Folake’s mother, anyone can ask Remilekun’s mother, Femi takes good care of his children.